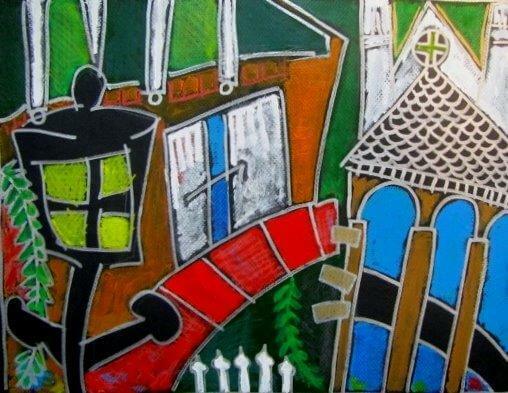 Connect Gallery will host Robert Klein Engler’s Forgiveness Series February 4-28, with a reception on February 20, 5:30-9 p.m.
Robert Engler began creating these brightly hued works on paper in New Orleans two years ago. Ranging greatly in size, each work is carefully crafted, using cut paper and painting techniques in a panoply of media choices. Referring to the designerly flat shapes of early pioneers of Modernism, like Marsden Hartley and the de Stijl movement, Engler’s goal is to move away from today’s safe “corporate art” and find themes which echo Modernism, but contain more symbolic meaning. As both a writer and poet, as well as a consummate designer, Engler is offering a rich array of works in this exhibit. He hopes to give viewers in his new Omaha home a modern art that also offers a spiritual element for their enjoyment and enrichment. Connect Gallery is located at 3901 Leavenworth. Gallery hours are Wed-Sat, 11-5 p.m.